Microsites are excellent ways to concentrate on one aspect of your business, one service or one product. Because the entire website is geared to promoting that single product then it’s excellent for search engine optimisation meaning that all of the keywords, etc, on the site can be geared to just a few terms. Microsites cost from only £200 for a one page website, web hosting & email addresses, contact us for further information. 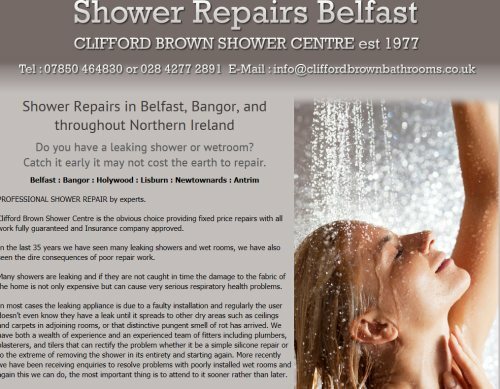 Clifford Brown Bathrooms is an existing client of ours who recently asked us about running a campaign to promote their shower repair service. Shower can leak without us even knowing about it, causing a lot of damage to the fabric of the property.